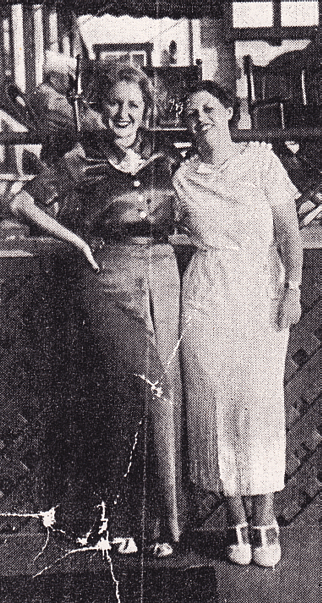 Michael’s Note: Lenore Heidorn was the president of Billie Dove’s fan club in the early 1930s. A Chicago native, she made lots of visits to Hollywood to meet her favorites. Here is her story about meeting Margaret Lindsay. Enjoy. The highlight of my recent visit to sunny California was my meeting with the charming Warner Brothers actress, Margaret Lindsay. I had long admired her and had written numerous letters, but had never received any reply, so I was doubtful as to whether anything would come of my letting her know that I would be in Hollywood soon, and that I would like to see her. Upon our arrival in Hollywood, our first stop was at the home of Millie Wist, whom I had asked Margaret to contact if she would like to see us. Millie told us that Margaret had called Tove Blue (Monte’s charming wife), a mutual friend, twice to see if we had arrived. To cut short the preliminaries, Millie arranged to have Margaret meet us for cocktails at her home the following Tuesday. Lenore (right) with Margaret Lindsay (center) and Tove Blue at The Tropics, Beverly Hills, about 1939. The time of our meeting finally arrived. I was quite jittery because I had heard so much about Margaret being high-hat and aloof, but how decidedly untrue this is. I found her to be one of the loveliest, friendliest people I had ever met out there. Over our Cuba Libres, we had a grand visit. I found that she had read my letters, for she constantly referred to many things I told her in them. Margaret was working at the Columbia studios in There’s That Woman Again with Melvyn Douglas and Virginia Bruce, and had recently completed Garden of the Moon with Pat O’Brien and John Payne. Knowing that I worked in the long distance office of the telephone company, she asked me if we ever listened in on conversations. I said that we were not supposed to, but occasionally we did. Then she told me of the time she had just been awarded a good role in a picture and had called her mother in Dubuque (Iowa) to tell her the good news. She was surprised when her mother wrote her later and told her that a few minutes after her call, people began calling her to congratulate her! I attributed that to the smallness of the Dubuque office, as I told her we didn’t have time to listen in. We were too busy, besides it being against the rules. So after all my waiting, I found Margaret to be just as I had always imagined her . . .beautiful, cultured, and most of all, friendly and sincere. Dove Tales – Let’s Go! Dove Tales was the official organ of the Billie Dove Fan Club, an organization that had its roots in the late 1920s. Dedicated to one of Hollywood’s most ravishing movie stars of the 1920s, Billie Dove, the club remained in existence until the death of its long-time president, Lenore Heidorn Foote, in 1999. 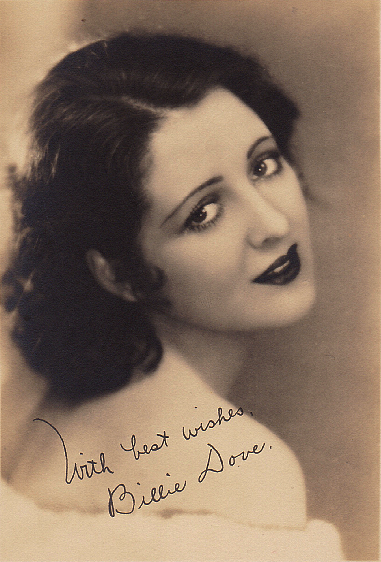 My favorite Billie Dove portrait... well, one of my favorites! Lenore, or Lee (as her friends called her), dubbed her friendship with Billie one of the longest that Hollywood ever birthed and fostered. After my 1994 interview with Billie for my book, The Sound of Silence, Lee contacted me with her stories. The next time I ventured to the Coast, I spent the day with Billie in Rancho Mirage and an afternoon with Lee at her home in Vista, California. Within the next several months or so, I want to share with you the story of the friendship between Billie Dove and her fan club president. I’ll call this series, Dove Tales, after the fan club newsletter. I want to share the story of how a starstruck youngster from Chicago became the fan club president for one of the most beautiful stars Hollywood has ever known. In the course of my series, I’ll share with you Lee’s firsthand account of traveling to Hollywood in 1934 and how she was entertained by Billie and scores of other “picture people.” Her diary is fascinating, I think, especially for those of us who feel we somehow belonged in that bygone era. While sharing Lee’s story, I will also sprinkle in some of my own recollections of Billie and Lee. For instance, here is an anecdote that didn’t make it into my book. Billie and I were on the phone one evening when the subject came around to Greta Garbo. Billie had a story. Like Billie, Lee was a great storyteller. You will recognize many of the stars she encountered on her adventures in Hollywood: Thelma Todd, Jean Harlow, Lina Basquette, Ruth Roland, Ivan Lebedeff, and others. 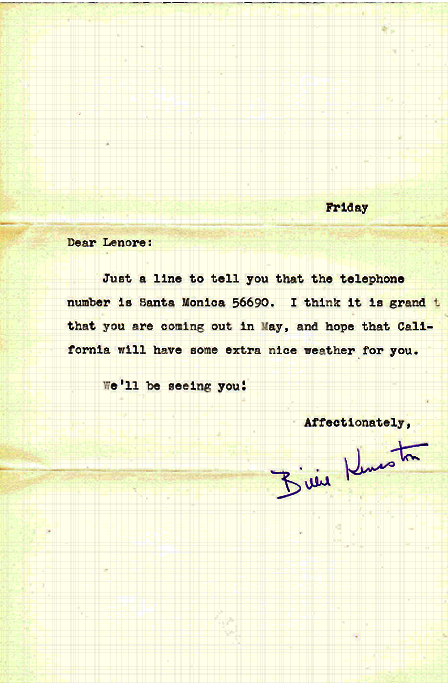 Here’s the letter that Billie mailed to Lee in preparation of Lee’s trip to Hollywood. Happy New Year, everyone! I’m looking forward to journeying back with you to Hollywood of the 1930s — in 2012. Let’s go!